A gorgeous 7 inch TFT color screen that’s easy to read from far away. 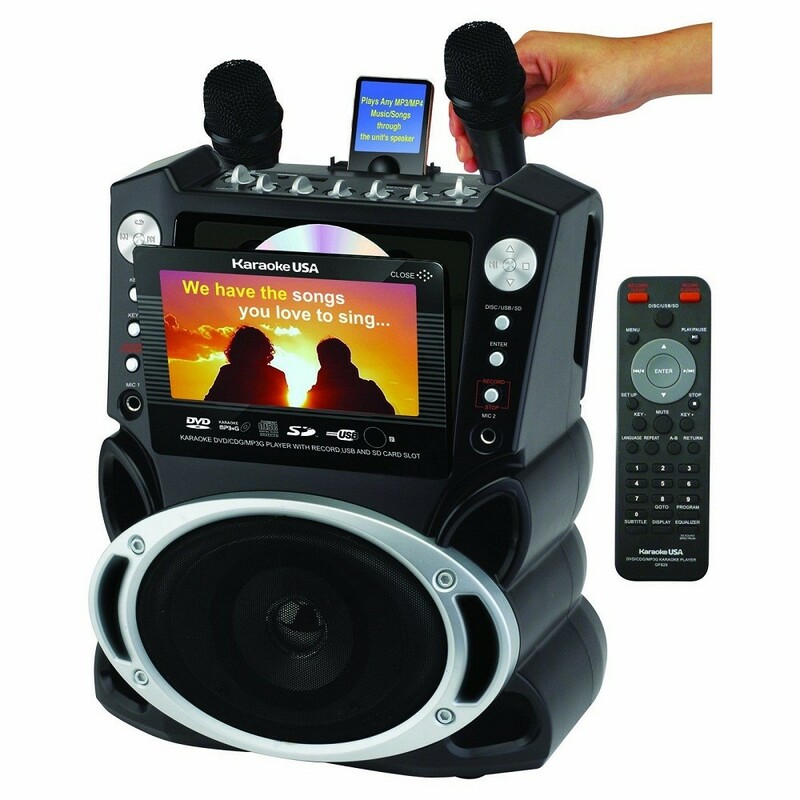 This system comes with 300 MP3G songs on disc, but will play any normal karaoke CDG or karaoke DVD. Sing any song you like, the fun can never stop. Not only can you perform your favorite hits but you can also record your voice onto an SD Card in MP3 format from your favorite karaoke disc. You can also download then play it back or take it with you. If you are just beginning your singing career or need a little confidence boost, Karaoke USA has included analog echo control, balance control and digital key control to make you a star. Not only can you sing your favourite songs but you can also watch any of your favorite movies on DVD right on the 7-inch display. Sit back and relax. This system comes with a handy remote to complete the experience. Invite friends and family to sing along with 2 included karaoke microphones. Keeping in tune with the digital age, the GF829 system has an auxilary input for any personal player and gaming console, A handy cradle is built in to rest your MP3 player for charging or watching your player's screen in an upright position, USB and SD card slots and 2 karaoke microphone inputs. Connect to a big screen TV, or better, your home entertainment center for enhanced sound.